Located in Egg Harbor Township, the Atlantic City International Airport (IATA: ACY, ICAO: KACY, FAA LID: ACY) is the main port of entry to the Jersey coast, just 10 miles northwest of Atlantic City. The airport is a joint civil-military airport, operated by the South Jersey Transportation Authority, and one of the busiest airports in the state. The Atlantic City Expressway provides quick, easy access between the city and the airport. 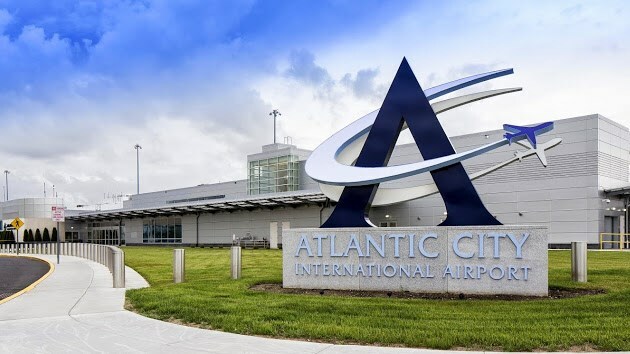 Atlantic City International Airport was a popular hub for scheduled airline service, however, many services have been discontinued or canceled due to lower passenger totals; the majority of planes heading to Atlantic City International today are general aviation and charter flights. Featuring two runways, the airport is capable of accommodating a wide range of aircraft sizes, ranging from turbo-props and light jets to VIP airliners. The airport features two runways to accommodate private aircraft of all sizes, along with a single passenger terminal where Signature Flight Support operates an FBO. The airport features free Wi-Fi for passengers inside of the terminal. Atlantic City Jet Charter offers on-demand private air charter service to/from Atlantic City, New Jersey. Our team has access to thousands of Wyvern-certified aircraft around the world, giving us confidence that we can arrange the perfect flight, whether you’re traveling internationally or domestically. The most popular aircraft for charter flights to Atlantic City include light jets (Cessna Citation, LearJet 35), midsize jets (Falcon 20, Hawker 900XP), heavy jets (Challenger 600, Falcon 900, Gulfstream II, III, IV), and long range jets (Gulfstream V, and Global 5000). Check out our aircraft gallery to review all aircraft options for your charter flight. Located upstairs in the terminal, it’s the perfect place to grab a bite to eat, a cup of coffee or a magazine to read – all in one place. Enjoy gourmet coffees, teas, lattes, frappes and cappuccinos, and a wide selection of mouth-watering baked goods and treats. This full-service bar serves items that are made to order. Breakfast items include everything from coffee and Danish to customized omelets and breakfast sandwiches. Lunch and dinner menus include burgers and sandwiches hot off the Panini Press, garden and chef salads, and a selection of beverages. The refurbished restaurant bar is located on the first floor of the terminal lobby and stands ready at 5 a.m. to serve your needs. Offers Irish fare as well as American classics. They feature many craft beer’s by the bottle or on draft. Offers quick-serve, made-to-order services to passengers who have cleared screening. Located on the second floor of the terminal and open at 5 a.m., Thrashers offers gourmet bagels and orange juice, as well as delicious breakfast sandwiches and platters. The lunch menu expands to include both hot and cold sandwiches, snacks, and a selection of beer and other beverages. A technology park housing Next Generation Air Transportation System is currently under construction on the airport property on lot near Amelia Earhart Boulevard and Delilah Road. The seven-building complex is set to contain offices, laboratories and research facilities. The park will focus on developing new computer equipment that will transform the country’s air-traffic control program into a satellite-based system. The first of the buildings was originally set to open in April 2012 and will contain a lab for the FAA as well as research space for other tenants. A second office park, the NextGen International Aviation Center for Excellence, is set to be built in nearby Hamilton Township, adjacent to the Hamilton Mall and Atlantic City Race Course, the latter of which is set to be renovated. A new transportation center at the site would transfer workers between the two complexes. In 2009, the SJTA awarded a contract to a Ventnor City, New Jersey-based construction firm to construct a hotel at the intersection of Tilton and Delilah Roads. Plans call for a 135-room hotel including some extended-stay suites, about 6,000 square feet of conference space, 22,000 square feet of retail space and possibly a restaurant. The hotel would be built to accommodate a new flood of business travelers brought by the NextGen technical park. The SJTA revealed plans for a major road improvement project that would link the airport directly to the Atlantic City Expressway, with construction beginning as early as 2013. The plan includes new ramps with two overpasses over the expressway. The road would connect Amelia Earhart Boulevard with a bridge over Airport Circle. Plans also call for building a service road with another overpass that would provide access to Delilah Road. Another project involves the installation of an overpass at the end of Amelia Earhart Boulevard next to the entrance to the FAA tech center. The proposed roadway would intrude upon a small section of a mobile home park and land owned by Egg Harbor Township. Call or request a free quote for your upcoming charter flight to (KACY) Atlantic City International Airport. Our private aviation team is available to you 24 hours a day, 7 days a week, and we’re happy to assist in all aspects of aviation. We offer an easy, hassle-free booking process while providing clients with outstanding aircraft options, competitive quotes, and top-notch service. Enjoy working with an air charter broker you can trust, and allow our team become your comprehensive solution for luxury air travel, aircraft acquisition and private jet management at (KACY) Atlantic City International Airport in New Jersey.